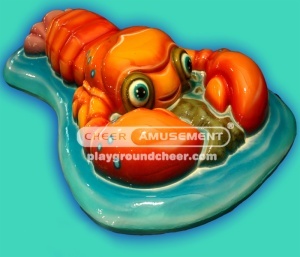 This lobster shaped item is also very popular among the young players due to its lovely cartoon decoration performance. Moreover,these foam stuffs are not only soft touching but also very durable. It can be incorporated into FEC to creat more fun elements. All playground equipment of the company can be adjusted in the shape and size, if you want, please contract it with the salesman; The company payment method: T/T 50% deposit and 50% balance before loading; We will delivery after receiving the deposit within 30 days, and you can choose sea, air and so on many kinds of transport mode; All playground equipment have been fully packaging, delivery guarantee product safety; For the company's products, we can send technical personnel who would assist and guide the installation supervision and using of the product, and this is decided by yourself; Our company products provide 1 year limited warranty and after-sales service; Please remark: playground equipment need to protect from fire and cutting, as far as possible avoid touching flammable or sharp objects! Brand: Cheer AmusementBelong to: Amusement park, Indoor playground, Children toyDimension: 35 sqmWeight: 1200kgLength: 7.6mWidth: 4.56mHeight: 2.7mCapacity: 20 kidsComponents: double slide, ball pit with balls,play houseMaterial: Galvanized steel pipe, foam poast pads, PVC vinyl, flooring matsAge for: 3-12 yearsPayment terms: T/T 50% deposit, the balance to be paid before loadingLeading time: 20-25 days after receiving the deposit.After-sale Service: 1 year limited warranty Technicians: Installation to be provided Remark: We can custom design for your playground upon the floor plan of your site. Name: Rock RollDimension: 230cmL * 150cmW * 220cmH This is our new type rock and roll. Kids could sit on the bench, parents or staff pull the ropes and make the kids swing. Name: Rolling BarrelDimension: 350cmL * 208cmW * 155cmH This is rolling barrel which assembled by airtight, ladder, and frames. Kids could climb into the airtight cylinder and make it rolling by walking inside. Name: Mini SpinDimension: 160cmL * 215cmH This is one of our products of rotating series named mini spin. Kids could sit on the balls spinning.